Taking Control To The Highest Level: The T9 is the ultimate tractor, designed for the world's largest agribusinesses that require unbridled power, unsurpassed strength and the most dependable and advanced systems to push your operational performance to a new level. Take a closer look at the T9 advantages that improve your productivity, decrease your cost of ownership and boost your bottom line. A Family of Choices: New Holland understands that maximizing your uptime and productivity, while minimizing losses, is what drives your profits. That's why we offer a family of T9 Series tractors with seven horsepower levels, with one that's the right fit for your operation. Whether you need a wheeled tractor, a scraper model, or one of two SmartTrax™ II designs, New Holland has a T9 model to keep you comfortable, make you efficient, and maximize your profitability. CVT or Powershift Transmissions: T9 Series tractors are the first articulated high-horsepower 4WDs with a Continuously Variable Transmission (CVT). Choose from 10 Auto Command™ CVT tractor configurations with up to 605 max horsepower that deliver improved productivity, huge versatility, superior efficiency and limitless control. Or choose New Holland's proven Ultra Command™ powershift transmission. The latest improvements reduce shifting and shuttling time to decrease fuel use, decrease operating costs and reduce fatigue. Two SmartTrax™ II Design Options: Only New Holland offers you two choices for improved traction, superior flotation and reduced compaction. Choose New Holland's exclusive Hi-Idler design with an aggressive approach angle for climbing over obstacles and field debris with reduced berming. Or choose the more economical Standard track design for the benefits of the same 11,200-square-inch total footprint with the added plus of industry-leading turning and a lower pricetag. The T9.600, T9.645 and T9.700 are available with either track design, while the T9.535 and T9.565 are available with the standard SmartTrax II design. 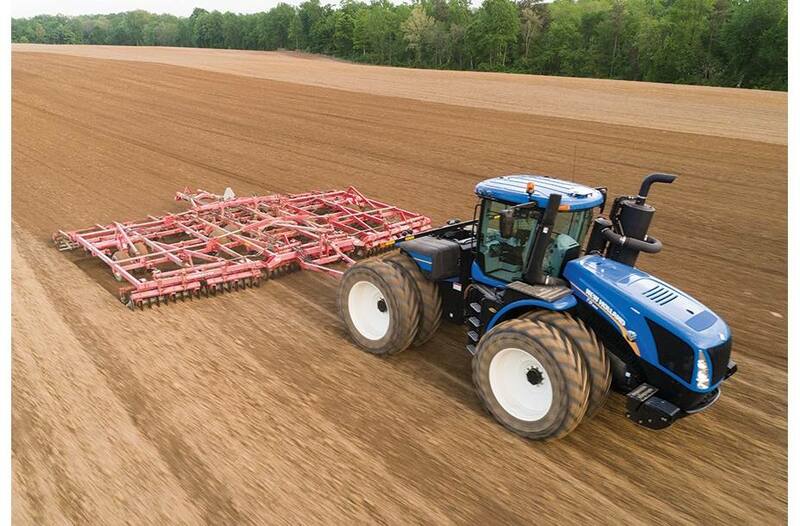 Ready For Precision: Every T9 is factory-ready to farm with precision using New Holland's full range of optional Precision Land Management (PLM™) solutions. The Tested and Reliable Power and Efficiency You've Come To Expect From New Holland: Your T9 tractor is powered by an ECOBlue™ HI-eSCR (High Efficiency Selective Catalytic Reduction) Cursor engine developed by New Holland’s sister company FPT Industrial. These engines, which comply with the even-more-stringent Tier 4B emissions standards, offer you four key benefits. Inside ECOBlue™ HI-eSCR: This New Holland system delivers the highest NOx conversion efficiency in the industry. The patented SCR-only emission system is a true after-treatment system and works outside the engine. This allows the engines to produce class-leading power and reaps the benefits of better fuel efficiency compared to EGR/Diesel Particulate Filter (DPF)/SCR emissions system found in competitive models. This multi-patented system uses an Engine Control Unit, which not only manages the engine, but also the HI-eSCR after-treatment system by controlling the supply and dosing modules. Using a dedicated closed-loop system, it continuously monitors the NOx levels in the exhaust gases, ensuring that during every cycle the precise amount of DEF is injected to achieve NOx conversion of over 95%, all while guaranteeing low fluid consumption. 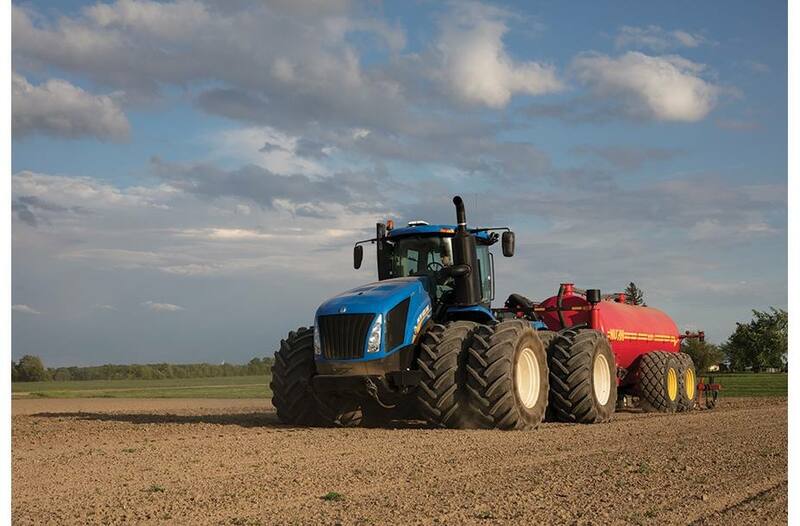 ECOBlue™ HI-eSCR: Your Power Guarantee: ECOBlue™ HI-eSCR technology has increased the power and already-exceptional productivity of your T9 tractor, independent of fuel quality, sulphur levels and without the need for costly diesel additives. That’s more power from less fuel with clean emissions. Powered By FPT Industrial: New Holland is not going it alone when it comes to Tier 4 technology. They can draw on the experience of their in-house engine development group: FPT Industrial. The Importance of Transient Response: At New Holland, we’re passionate about transient response. It’s your productivity guarantee. Put simply, since your Cursor engine breathes only clean fresh air, it can react more quickly when placed under load—a lot more quickly in fact. So when you’re transporting heavy trailers or grain carts and you encounter a hill, you’ll be able to maintain constant forward speed with no slow down. Transient response. We’ve got it covered. Save Fuel To Reduce Your Carbon Footprint: Emissions released from burning diesel are a significant contributor to a farm’s overall carbon footprint. ECOBlue™ HI-eSCR technology for Tier 4B compliance reduces NOx emissions and maintains the T9 Series’ impressive fuel efficiency, bringing about a substantial cut in your farm’s carbon emissions. Engine Power Management: Engine Power Management is a renowned New Holland tractor feature. In short, the engine develops more power and torque according to the load on the transmission during hydraulic, PTO, and transport. On a T9.600 tractor, EPM delivers up to 62 additional horsepower but only when it is needed to maintain performance. Designed For Agriculture: Purposely developed for agriculture, the two-stage turbocharged engines of the T9.600, T9.645 and T9.700 tractors are all part of the proven New Holland efficiency package. The aim? To deliver improved power and sustained output in varying load conditions. You get all the power you need from less fuel. And, of course, all models meet stringent Tier 4B emission standards. Your Choice of Complete Control: Select from two intuitive New Holland transmission choices – the traditional Ultra Command™ full powershift transmission or the NEW Auto Command™ Continuously Variable Transmission (CVT) for ultimate precision and smooth control. Auto Command™ CVT (T9.435 I T9.480 I T9.530 I T9.565 I T9.600): When you pair the extreme power of New Holland T9 Series 4WD tractors with the precise control of the Auto Command™ CVT, you make your workday more comfortable and productive in the most demanding conditions. It provides faster acceleration to road speed at 1,650 engine rpm, and gives you maximum speed control. Use three adjustable target speeds to match your every need. Simply set your target speed anywhere between 3.0 feet per minute right through 25 mph and regulate it to the nearest 0.01 mph. No steps. No range changes. Just seamless speed changes to match the jobs you do, from seeding to hauling and running grain carts. Superior Versatility and Efficiency: The Auto Command transmission allows for easier slow-speed operation, more precise speed control for high-value crops and added safety when backing up to hookup large implements. Using Auto Command saves you fatigue and fuel. You get automated efficiency without operator input, and can operate at peak power for any forward speed. Limitless Control: The Auto Command responds to the amount of force you apply to the CommandGrip™ controller. Move the lever gently for gradual response, aggressively for quick response. Other controls are just as intuitive thanks to New Holland’s award-winning SideWinder™ II armrest with fully integrated IntelliView™ wide touchscreen display. Select from four driving modes to suit your driving style: • Auto Mode. Select the desired target speed and Auto Command matches the engine and transmission to maintain it. • Cruise Mode. Set Auto Command to maintain a desired operating speed for economy and productivity. • Manual Mode. Set the required engine and forward speed, independently of each other. • PTO mode. As soon as the PTO is engaged, Auto Command guarantees a constant engine speed. The Simplicity and Peace of Mind of Active StopStart: When you bring the tractor to a standstill, Auto Command prevents the tractor moving backwards or forwards, even with a heavy load. When you release the brake pedal, drive reengages and the transmission assures there is no risk of roll back on steep inclines. Imagine the efficiency you’ll gain when transporting or during frequent shuttling. That’s Active StopStart. Ultra Command™ The Full Powershift (Available On All Models): New Holland has toughened up its already proven Ultra Command™ full powershift transmission. Now with added strength and improved control, it is truly something special. It gives you the benefit of a new control system using the CommandGrip™ handle for fingertip access to ‘manual’ push button shifts and automated Ground Speed Management. A Hi-Lo dual power is fitted to gear 16, allowing you to quickly increase maximum transport speed from 19 to 25 mph. Best-In-Class Power, Torque, and Overall Fluid Efficiency: The T9.700 with Ultra Command™ powershift set new benchmarks in drawbar fuel efficiency, drawbar horsepower and maximum pull when tested by the Nebraska Tractor Test Laboratory (NTTL). In fact, tests found the complete T9 Series tractor line features power, torque and overall fluid efficiency that lead this tractor class, which means better productivity and reduced operating costs for you. Save Time and Fuel: The latest Ultra Command improvements reduce the time it takes to shift and shuttle. You can shift from gear 1 to 16 in 20% less time and shift from forward to reverse 38% faster. The result: Ultra Command uses less fuel, decreases operating costs and reduces fatigue. GSM. Intelligent Automation: New Holland Ground Speed Management (GSM) is more than just an automated transmission shift system. Simple to set up and extremely efficient, GSM is a dependable way to reduce operator fatigue and fuel consumption to increase overall productivity. With CVT-like functionality, it uses a combination of data relating to engine load, forward speed and operator setting to manage both engine and transmission speeds to optimize performance and economy. Fixed Forward Speed? GSM Takes Care of It: When load conditions change in the field, GSM automatically maintains a fixed forward speed. Just set your desired working speed and then select the GSM function. The automated system then matches engine and transmission speeds to maintain this fixed forward speed, to deliver the perfect balance between maintaining productivity without compromising economy. Full Command In Transport: During road transport, GSM automatically shifts the transmission according to load and throttle settings. With heavy loads, GSM downshifts to assist with engine braking on steep inclines. Impressive Hydraulic Flow To Handle The Largest Implements: Hydraulic capacity is an integral part of T9 4WD tractor design. The hydraulic system offers the capacity, control and flexibility to perform multiple hydraulic functions simultaneously—without sacrificing performance. Up To 113 Gallons Per Minute: T9 tractors are available with standard or high-flow pumps, with 42 and 57 gallons per minute (gpm) respectively. For demanding hydraulic applications, the optional MegaFlow™ pump delivers a maximum of 56 gpm to one bank of remotes, boosting total tractor flow up to a maximum of 113 gpm! For total 13-gpmflow to all remotes for extremely high hydraulic demands like seeding and planting, choose the MegaFlow II option. A large coupler kit is available for applications that demand unrestricted oil flow. Save Time and Effort with Custom Headland Management: New Holland has refined and developed Custom Headland Management for easier setup and use. For complex applications, including operating the very widest tillage equipment, Custom Headland Management truly does reduce fatigue and help remove the repetition from your day so you can concentrate on what’s really important. Use Custom Headland Management to manage some operations but leave others to manual control – the choice is up to you. Set up is simply a case of recording the desired operations at the headland. These actions are then repeated, automatically, by pressing the dedicated button on the CommandGrip™ handle. Up To Eight Electronic Remotes: All T9 models offer the convenience of electronic remote valves—up to eight of them. They’re simple to set up and easy to control without moving away from the SideWinder™ II armrest so you can work with exact precision. Four remote levers are on the armrest and two valves are controlled either using the two additional paddles located to the right of the IntelliView™ monitor, by using the CommandGrip™ handle or by using the electronic joystick. You can set flow, timing and detent settings to precisely match the job. Each valve can also be programmed with Custom Headland Management. Flow Control Using IntelliView: The IntelliView™ touchscreen display makes it simple to set the flow rate to individual valves. Just scroll through the menus and select valve control. Choose the outlet you want to adjust, and drag the slider with your finger to the desired setting. Job done. Up To 20,000-Pound Hitch Lift Capacity: All models can be equipped with a CAT IV–N quick-hitch rear linkage, convertible to CAT III on standard frame models. Lift capacity rises to more than 20,000 pounds on standard frame tractors, in line with the high power output of the T9.560. A 20-spline 1000-rpm speed PTO option is also available. The New Holland Tri-Point Chassis: The exceptionally robust, articulated tri-point chassis used on the T9 is engineered to reduce maintenance and provide exceptional strength. The Tri-Point system ensures a wellbalanced weight transfer between the front and rear axles that means significantly less ballast is required in both drawbar and three-point hitch applications, resulting in reduced weight to meet the demands of controlled traffic farming. T9 scraper tractors use the same Tri-Point chassis. No costly modifications are needed. Wet, Steep or Rolling Terrain? 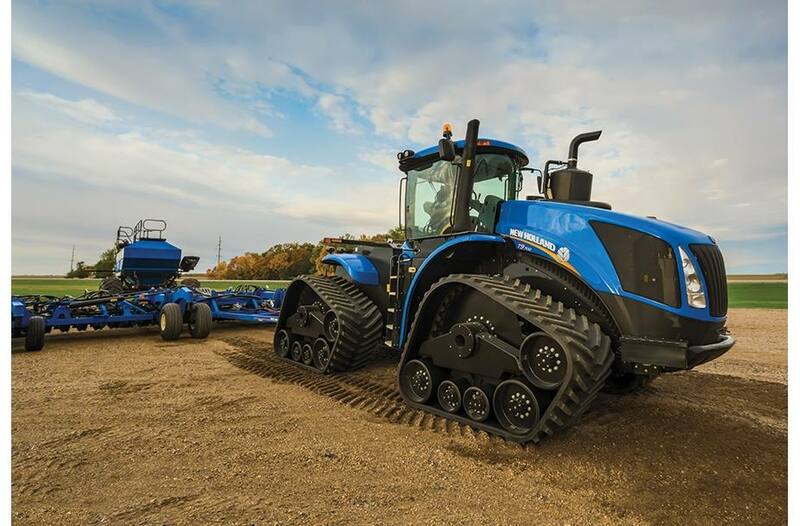 SmartTrax™ II Is For You: Put one of New Holland’s five T9 Series SmartTrax™ tractors to work for you and you get the benefit of 2,800 square inches of ground contact per track module for a total footprint of 11,200 square inches. That maximizes traction, flotation and ride smoothness, while reducing ground pressure and compaction for minimal surface damage, and that improves soil fertility and water drainage, maximizing your yields. A Smoother Ride: Not only do you get the comfortable, smooth ride that comes from a larger footprint, T9 SmartTrax™ II models also feature New Holland’s four-point Comfort Ride™ cab suspension, standard on all SmartTrax II models, for an even smoother ride. Powershift or CVT, 5 HP Choices: Whether you prefer the smooth shifting of the dependable Ultra Command™ powershift transmission or the greater precision and efficiency of the new Auto Command™ continuously variable transmission (CVT), there’s a SmartTrax II model for you. Choose models with 470, 500, 535, 580 or 620 horsepower. 2 Track Choices, 2 Belt Lug Choices To Fit Your Needs: No other manufacturer offers you the choice between two track designs, so you can choose the one that best suits your terrain, your applications and your budget. 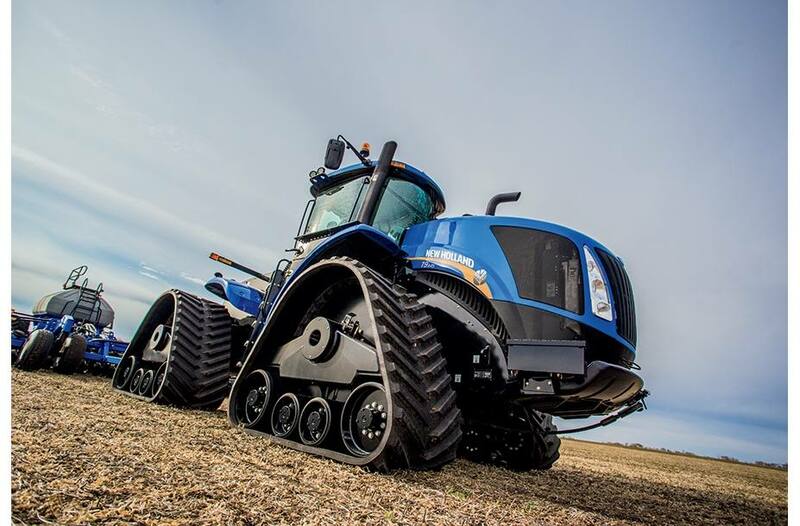 And, only New Holland offers you two track lug options — the two-inch agricultural lug tread or the exclusive deep traction lug tread with a 2.6-inch tread depth for added traction and pulling capability in very wet, loose, or soft soils. Standard or Hi-Idler Design - A New Holland Exclusive: Choose the track design that best suits your needs. Only New Holland offers two choices so you can choose the one that best suits your terrain: the SmartTrax™ II standard track system or the exclusive, premium SmartTrax™ II Hi-Idler design with aggressive approach angle. No matter which design you choose, you get these performance advantages: 1. The axle position of the SmartTrax II design results in a low center of gravity which improves total vehicle stability. 2. Designed with no midroller directly under the track module pivot point. This reduces overcenter ride impact for maximum operator comfort. 3. The largest drive wheel in the industry measures a massive 56.3 inches in diameter – that’s 30% larger than the nearest competitor. 4. 7 to 8 drive lugs (Hi-Idler design) and 13 to 14 drive lugs (Standard design) are fully engaged at all times, eliminating slippage between the drive wheel and track. This also reduces the load per lug compared to other designs which increases durability. More power is transmitted through more drive lugs for better power disbursement and extended track life. 5. A heavy-duty scraper cleans the drive wheel and drive lug area from dirt and debris to avoid misalignment and increased belt wear. 6. Integrated accumulator/tensioner automatically adjusts belts for proper tension. 7. A sight gauge permits simple observation of track tension pressure. Exclusive SmartTrax™ II Hi-Idler with Aggressive Approach Angle: No one else on the market offers tracks like these. New Holland’s Hi-Idler design features an aggressive approach angle that allows the tracks to climb out of situations rather than plowing through them, reducing berming/snowplowing and scuffing. The aggressive approach angle also helps the tractor to maintain flotation in wet conditions. The SmartTrax™ II Standard: For operators seeking the benefits of track operation at a lower cost, the SmartTrax™ Standard track system offers an economical alternative. It delivers the same high-traction, low-compaction benefits without aggressive approach angle of the premium Hi-Idler design It also provides industry-leading turning. Easier, Full-Power, Articulated Turning: New Holland has a class-leading, 38-degree articulation angle. This maneuverability can lead to quicker headland turns so you get the job done faster – yet another way New Holland saves owner/operators money. The 4WD articulated steering allows for all four tracks to remain on the ground at all times – while turning and while travelling straight – so torque is transferred equally during turns, reducing loss of traction and decreasing soil disturbance. Rugged Durabilty, Less Maintenance, More Uptime: • All bearings are sealed and lubricated for a lifetime with annual maintenance • No daily greasing as there are no grease fittings • Check the bogey and idler wheel oil levels only once a year and change at 5,000 hours • No need for complex alignment adjustment mechanisms that need to be adjusted, serviced, and replaced. The SmartTrax II rigid undercarriage shaft bores are machined in one operation that ensures excellent alignment between bores, plus New Holland uses straight steel cables in the heavy-duty belts. Rugged Design Meets Perfect Balance: The exceptionally robust, articulated tri-point chassis used on T9 is engineered to reduce maintenance and provide exceptional strength. Tri-Point Oscillation For Benefits In Any Application: Whether you’re seeding, leveling, cultivating or applying nutrients, New Holland’s exceptionally robust articulated Tri-Point chassis ensures precision ground following and smooth transfer of power to the ground to improve performance and results. The center section has a large top link that extends from the front frame to the very back of the rear frame transferring dynamic loads more efficiently and maximizing your pulling capability, which in turn lowers fuel usage. In addition, this tri-point oscillation ensures well-balanced weight transfer between the front and rear axles so significantly less ballast is required in both drawbar and three-point hitch applications, resulting in reduced weight to reduce compaction and meet the demands of controlled traffic farming. The Right Balance: It takes experience to ballast an articulated tractor correctly. Get the weights wrong, and performance, fuel use, soil compaction and productivity can all suffer. At New Holland, we have established ballast guidelines that make it easier to optimize ballast, with purpose-developed weight packs that can be tailored to match your needs. Massive, Heavy-Duty Axles Built For The Job: Regardless of the model you choose, T9 axles are built to stand up to high torque loads. Planetary input gears offer the ultimate in quiet comfort too. The massive 5.5-inch-diameter, heavy-duty axles with 18-bolt hubs carry up to 66,000 pounds of gross vehicle weight and offer superior braking. What this means to you is greater strength, durability, and reliability. TerraLock™ Traction Management: Terralock is standard equipment and automatically manages four-wheel drive and the engagement of front and rear differential lock. Of equal importance, the system takes care of disengaging 4WD when you apply the brakes and when working at high speeds. True Traction: With a high-powered articulated T9 tractor you have the benefit of true 4WD. On both axles, the differential lock, which is standard equipment on all models, is hydraulically activated and locks the differential for positive drive. New Holland's differential lock provides two independently controlled systems for both the front and rear axles. The result is improved traction, especially in adverse conditions When conditions get tough, you and your New Holland T9 keep going. Up To 20,000-Pound Hitch Lift Capacity: You can equip your T9 4WD with a CAT IV-N quick-hitch rear three-point hitch, convertible to CAT III on standard frame models. Lift capacity rises to more than 20,000 pounds on standard frame tractors, in line with the high power output of the T9.560. A 1,000-rpm PTO with a 1.75-inch, 20-spline shaft is also available. Drawbar Options To Suit Your Needs: A heat-treated, two-position agricultural solid bar is fitted to standard frame models. A heavy-duty Class 5 drawbar is offered on wide-chassis models. Max permissible tongue weight can reach up 15,000 pounds on Ag models and 20,000 pounds on scraper models, dependent on drawbar choice. T9: Built Scraper Ready: You can order the T9.530, T9.600, T9.645 and T9.700 factory ready for the demands of tough scraping, grading, leveling, cutting, filling and earthmoving jobs. These models come equipped with the same heavy-duty axles as our Ag models and a scraper drawbar. With combined high-capacity and MegaFlow™ pump options, hydraulic output can reach 113 gallons per minute. Enjoy The View From The Quietest, Most Comfortable Cab In The Business: Step into the spacious cab through the frameless door. At 76 decibels, a T9 cab is whisper quiet. Settle into the seat and rest your arm on the SideWinder™ II armrest. Work the buttons on the CommandGrip™ handle and remote valve levers. Swap through the menus on the IntelliView™ touchscreen monitor. Fire up the engine and feel its smooth, quiet power. Welcome to the New Holland T9. Settle In and Enjoy The Ride: The New Holland Comfort Ride™ cab suspension is revolutionary and is offered on all T9 Series tractors and is standard on all SmartTrax™ II models. All four corners of the cab are suspended on spring and damper units with a sophisticated anti-sway system to ensure you get a smooth and stable ride. All-Day Comfort: New Holland’s exclusive four-point cab suspension masterfully controls front-to-back, side-to-side, and up-and-down motions which ensures you are as comfortable after a long day’s work as you were before you started. Set Your Personal Working Environment: Set your preferred in-cab working temperature and the automatic climate control system maintains the setting, adjusting to suit ambient conditions. Pull down cab blinds to keep out the sun. High Quality Audio: The integrated radio allows every operator to play their own MP3 music recordings as well as receive crystal clear radio signals. Full access to weather radio channels is also available. 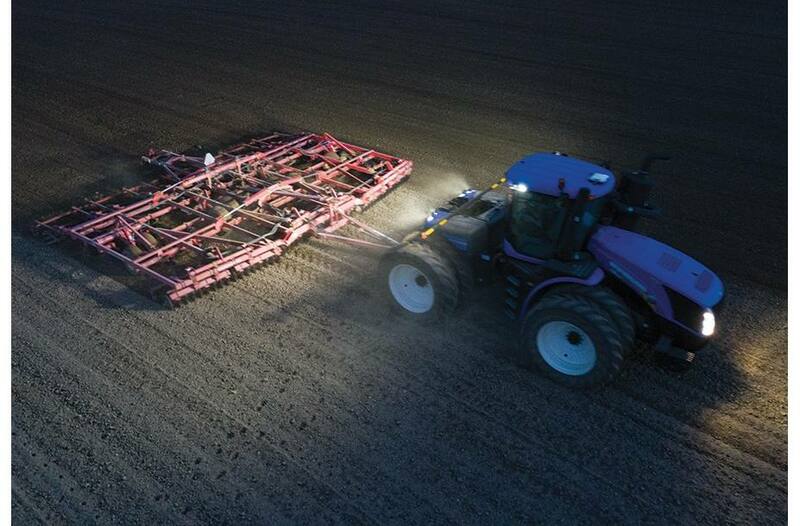 Bright Lights For Dark Nights: Lighting up the way for improved nighttime productivity and total safety is New Holland’s all-new lighting packages that feature up to 14 LED lights. Brighter and less power-consuming than their standard equivalent, these lights offer a broad spread of white light, turning night into day. Equip your T9 4WD with eight LED lights at the rear, two LED lights for each side with two optional front LED lights. The Most Comfortable Seat On The Farm: New Holland’s best-in class seat offering helps long days pass more quickly and comfortably. Choose from up to three options, all featuring firmer, more durable seat cushions to provide outstanding comfort whatever the terrain. Auto Comfort™ Seat: When you spend extended hours in the tractor, comfort and ease make a real difference in your productivity. That’s why you should consider the enhanced comfort of the ventilated semi-active Auto Comfort™ seat. This top-of-the-line seat automatically calibrates damping, using a network of sensors, depending on the operator’s actual weight, for the smoothest ride ever. The seat also features advanced ventilation technology, which warms the body on cold days and efficiently whisks away perspiration for ultimate comfort in all types of weather. Swivel For Ultimate Comfort: If you work with large rear equipment, you’ll appreciate the comfort provided by the seat’s 40° swivel angle. Moreover, the SideWinder™ II armrest moves with the seat, so the controls are always where you need them, with no need for stretching or fumbling. Comfortable rear visibility. Check. Instructor Seat: A full-sized upholstered instructor seat comes standard on most cab options, with a leather seat on our Luxury cab. The instructor seat is ideal when training new members of staff, and folds down to provide a work surface when not in use. SideWinder™ II: Designed Around You: As modern tractors offer increasingly sophisticated features, New Holland takes care they don’t become more difficult to understand and operate. We listened to our customers and developed the SideWinder™ II armrest to make everything simpler. It’s easy to access all key controls from the armrest – throttle, transmission and hydraulics – with quick access for more advanced features. And, the armrest adjusts to the position that suits you. Go ahead. Settle in. Take control. IntelliView™ Touchscreen Display: Get all the information you need at a glance with the standard 10.4-inch-wide, touchscreen IntelliView™ IV monitor. You’ll enjoy fingertip adjustment of all key settings as well as full compatibility with the New Holland IntelliSteer™ guidance system. Make Every Inch A Profit Center with Precision Land Management™: New Holland is committed to providing the right tools to help you improve your bottom line and PLM™ delivers on that commitment. By reducing in-field passes, considerable fuel savings can be achieved, which consequently reduce your farm’s carbon footprint. 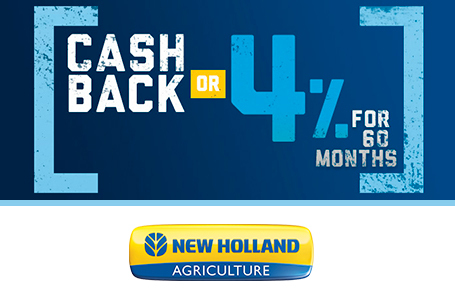 If you are ready to start saving time and money, work more comfortably, and get more out of every season with precision farming, New Holland Precision Land Management is ready to be your partner. Guidance Solutions: Factory fit on your T9 tractor. IntelliSteer™ auto guidance allows you to make fewer passes in the field and ensures accurate coverage with minimized skips and overlaps. Utilize one of the many guidance patterns available to reduce operator fatigue and increase efficiency and choose the level of correction that is right for you, ranging from WAAS (6- to 9-inch accuracy pass to pass) up through and including RTK and RTK+ (sub +/- 1 inch). Increase efficiency and decrease operator fatigue while using IntelliTurn™ for field preparation. IntelliTurn automatically guides the tractor while making turns, mimicking what an operator would do to maximize your infield efficiency and allow you to concentrate on the task. It features smart, intuitive setup, utilizing existing parameters for easy operation. Field Preparation: With PLM™ water control, you could increase yields by up to 25% and cut your farm’s water consumption by up to 30%. The field leveling technology facilitates land leveling and levee design for unsurpassed efficiency. Using the T9 Series tractors, you can create drainage solution packages that integrate survey data, analysis, design, installation and mapping to provide the most efficient drainage package. You can view field topographical data in 3D from any angle and exaggerate the vertical axis to visualize the shape and slopes of the field. Every T9 Series tractor with the IntelliView™ IV monitor is ISOBUS certified. That means that it has all of the ISOBUS capability that you need to run any brand of ISOBUS capable implement by simply plugging it in to the ISO 11783 plug in the back of the tractor. Data Management Solutions: This is a zero-cost package that enables you to read and write data such as client, farm and field names together with job data, including yield and coverage maps to popular precision farming devices. This is your core package for record keeping of fields, mapping and analysis. You can layer a variety of topographical and yield maps to establish yield performance, and compare these with average multiple-year maps to identify areas that deliver consistently high or low yields. You can also create variable-rate prescription maps using formulas based on soil types, together with yield or other maps. PLM Mapping allows you to create or edit guidance paths, and print reports for seeds varieties, restricted use chemicals, fertilizer usage, equipment maintenance and more. Access the profitability of field, livestock herds and equipment and print tax reports for both cash and accrual ledgers. If you want to keep up to date with the inventory for supplies, seeds, chemicals, fertilizer, feed, harvested crops and livestock, then you’ve just found out how! PLM™ Connect Telematics: PLM™ Connect keeps you connected with your equipment and your operation, providing you with real-time information for making decisions on the go. You can remotely monitor detailed machine information and communicate with your operators in real time, improving fleet utilization, productivity and efficiencies. You can receive maintenance alerts or a fault code alert if a problem occurs. 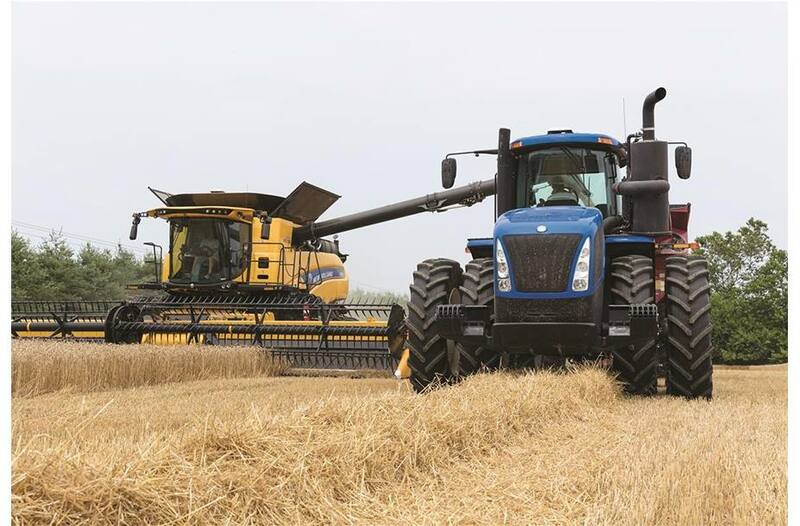 Partner with your New Holland dealer to proactively prevent maintenance issues, or quickly resolve issues in the field, ensuring that your machines stay running during the most critical times. Choose between PLM Connect essential or PLM Connect professional depending on your operational needs. Imagine if you could see every machine’s operating data from the comfort of your office. Well, now that dream is reality with the optional PLM Connect Data Transfer available within the PLM Connect professional package. Data is now transferred instantaneously from the field to the office and back again, which eliminates the need for you to visit every machine and exchange USB sticks and data cards. This saves you precious time and fuel, and means you respond to changing conditions as they occur. Built-In Reliability and Easier Servicing: The new T9 tractor family is designed to spend more time working and less time in the yard. All service points are easy to access, and super-long service intervals mean they will spend more time in the field. Easy Access: The single-piece engine hood opens wide for full service access. Coolers open out to make cleaning faster and easier. Engine and hydraulic oil check and fill points are easy to reach too, making routine checks fast and servicing simpler. Engine service intervals have been extended by 100% to 600 hours. Steps are provided to make it easier to clean the expansive glass of the four-pillar cab. Added Convenience: Toolboxes are conveniently mounted on both sides of the tractor for easy access and storage. A dedicated hatch provides fast, easy access to the engine air filter. There’s no need to lift the engine hood. The AdBlue/DEF additive tank has a lock which prevents accidental filling with fuel. It only needs to be filled at the same time as the fuel tank. Top Service™ Breakdown Assistance: Your peace of mind is our top priority. That’s why your T9 Series tractor is backed by New Holland Top Service including Breakdown Assistance. When you engage Top Service during an unscheduled service event, New Holland dealers are able to expedite parts deliveries, provide equivalent loaner units, and provide solutions that are unmatched in the industry in order to keep you working. 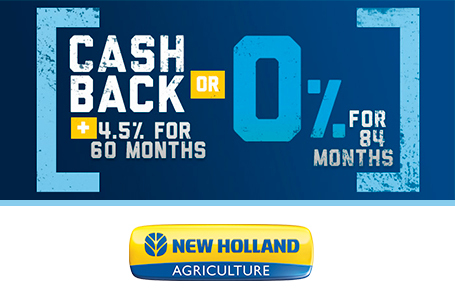 See your New Holland dealer for more details. Some exclusions or limitations may apply. 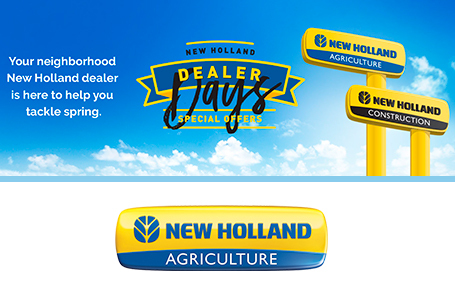 Complete Dealer Service Training: No one is better equipped to support you and your equipment than your New Holland dealer. Their service personnel fully understand technical concepts and the factory repair procedures that are key to product support. New Holland dealer technicians engage in structured certification training conducted online as well as during intensive classroom sessions to ensure they always have the skills needed to keep the latest and most advanced New Holland products running efficiently, and continually improve your peace of mind and satisfaction.